Eleven runners whose connections have Kentucky Derby (GI) dreams will race nine furlongs over Aqueduct’s main track in Saturday’s $750,000 Wood Memorial Stakes (GI) presented by NYRA Bets. The Wood Memorial offers 100-40-20-10 Kentucky Derby qualifying points to the top-four finishers means the winner and quite possibly the runner-up, depending on their current points earnings, will make the gate for the Kentucky Derby (GI) in four weeks. 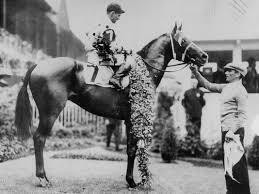 Since Triple Crown champion Gallant Fox in 1930 became the first Wood Memorial Stakes hero to win the Kentucky Derby, ten runners have followed — Gallant Fox, Twenty Grand, Johnstown, Count Fleet, Hoop Jr., Assault, Foolish Pleasure, Bold Forbes, Seattle Slew, Pleasant Colony and Fusaichi Pegasus in 2000. The race also boasts fellow Triple Crown winners Count Fleet, Assault and Seattle Slew as previous winners and a history book full of past winners such as Hill Prince, Native Dancer, Nashua, Bold Ruler, Damascus, Dancer’s Image, Slew o’ Gold, Broad Brush, Gulch, Easy Goer, Devil His Due, Unbridled’s Song, Empire Maker, Tapit and Frosted. Also the great champion Secretariat famously finished third in the Wood in 1973, the loss blamed on an abscess in his upper lip, which was believed to be aggravated by his bit. And even though no Wood winner since Fusaichi Pegasus has completed a Wood-Derby double, each year an exciting bunch races in New York’s marquee event to secure enough points to make the gate for the Run for the Roses. R.A. Hill Stable, Hugh Lynch, Corms Racing Stable and Reeves Thoroughbred Racing’s Tax, who was haltered for $50,000 by his current connections and trainer Danny Gargan for $50,000 at Keeneland last October, is now a legit Kentucky Derby contender thanks to his victory in the Withers Stakes (GIII) over the Aqueduct track two months ago. The dark bay son of Arch, who will lead the field to post under jockey Junior Alvarado was also third in the Remsen Stakes (GII) at this distance back in December. He currently has 12 Road to the Derby qualifying points. “He’s training tremendous; he looks good,” Gargan said. “We’re just hoping we get a clean trip. He’s a nice horse and we’re just hoping we can run top-three, so we can go to the Derby. Shadwell Stables’ homebred Haikal broke his maiden over Aqueduct’s main track back in December, then won two stakes races including the Gotham Stakes (GIII) last out and carries a three-race win streak into the Wood. The Kiaran McLaughlin-trained son of Daaher, who won the Wood with Frosted in 2015, closed from far back in the Gotham but may not be as far off the pace on Saturday. He will break from post position four under regular jockey Rajiv Maragh, who was aboard Wood winner Wicked Strong in 2014 and Irish War Cry in 2017. Juddmonte Farms’ well-bred Tacitus makes the trek north to New York after winning the Tampa Bay Derby (GII) by a widening 1 ¼ lengths from off the pace in his stakes debut four weeks ago. The Bill Mott-trained son of Tapit and the multiple grade 1-winning Close Hatches (by First Defence) already owns a win at Aqueduct, having broken his maiden at a mile over the surface back in November. The handsome gray colt, who earned 50 points for his Tampa Bay Derby victory, will have his regular jockey Jose Ortiz aboard once again. Let’s Go Stable and Richard Schibell’s Tampa Bay Derby runner-up Outshine will attempt to earn enough points to make the Kentucky Derby and also give his trainer, Todd Pletcher, a sixth Wood win to add to his current record. Pletcher previously won the Wood with Eskendereya (2010), Gemologist (2012), Verrazano (2013), Outwork (2016) and Vino Rosso (2018). The son of Malibu Moon drew post position ten and will be ridden by Hall of Famer John Velazquez, who has won the Wood four times, all for Pletcher. He only missed the mount on Gemologist. Repole Stable’s maiden winner Overdeliver makes his first start since a second-place finish to the highly regarded Win Win Win, who runs in the Blue Grass Stakes, in the Pasco Stakes at Tampa Bay Downs 2 ½ months ago. The son of Overanalyze is also trained by Pletcher, but will be ridden by Kendrick Carmouche for the first time and will break from post position six. Trainer Jason Servis, who won the Florida Derby (GI) last Saturday with former $16,000 claimer Maximum Security for Gary and Mary West, will saddle a pair of runners for the Wood, allowance/optional claiming winner Final Jeopardy for the Wests and maiden winner Grumps Little Tots for Michael Dubb, Coyle Boys Stable and Bethlehem Stable. 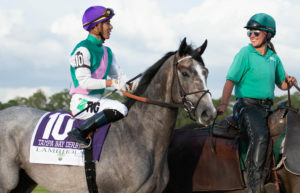 Final Jeopardy, a $110,000 son of 2007 Kentucky Derby winner Street Sense, broke his maiden at six furlongs first time out at Gulfstream Park in December and after a third-place finish in the Limehouse Stakes in early January, returned to the winner’s circle in a first-level allowance race last month. He takes a stab at graded stakes company for the first time with leading rider Manny Franco aboard breaking from post position five. Grumps Little Tots, who broke his maiden in his fourth start in a one-turn mile over this track last out, tests stakes company for the first time. The son of Sky Mesa, who was one of four late nominations to the Triple Crown (three run here in the Wood) will carry Jose Lezcano from post position eight. New York-bred Not That Brady was last by 74 lengths in the Gotham last out, but the son of Big Brown, who is a state-bred stakes winner, is certainly better than that even if this race is a tough task. He is trained by co-owner Rudy Rodriguez and is out of the popular fellow New York-bred stakes winner Lisa’s Booby Trap. Reylu Gutierrez will ride from from post seven. Michael and Jeff Fazio’s Joevia was second to Haikal in the Jimmy Winkfield in early February and then was second in the Private Terms Stakes last month. He is trained by Greg Sacco, who had his grade 1 winner Mind Control drop from the Kentucky Derby trail earlier this week, and will be ridden by Nik Juarez. The late Triple Crown nominee drew the outside post position. Hoffa’s Union is the third late nomination to the Triple Crown off a 15-length maiden win at Laurel Park at 1 1/16 miles. He was purchased privately by Gary Barber, Wachtel Stable and Chris Dunn after that win and is now trained by Mark Casse. Dylan Davis has the call aboard Hoffa’s Union from post three. Completing the field for the Wood is former claimer Math Wizard, who is trained by co-owner Saffie Joseph, Jr. 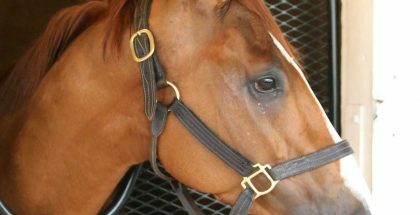 The son of Algorithms, who is also owned by partners John Fanelli, Collarmele Vitelli Stables, Bassett Stables, Ioannis Zoumas, and Wynwood Thoroughbreds, has been claimed three times so far in his career, twice for $16,000 and most recently for $25,000 by his current connections. The Wood is Aqueduct’s 10th race with an approximate post time of 6 p.m. ET. It will be part of a live national broadcast on NBC Sports Network from 5:30-7:30 p.m. ET, which also will include Blue Grass Stakes (GII) at Keeneland and the Santa Anita Derby (GI) from Santa Anita Park.